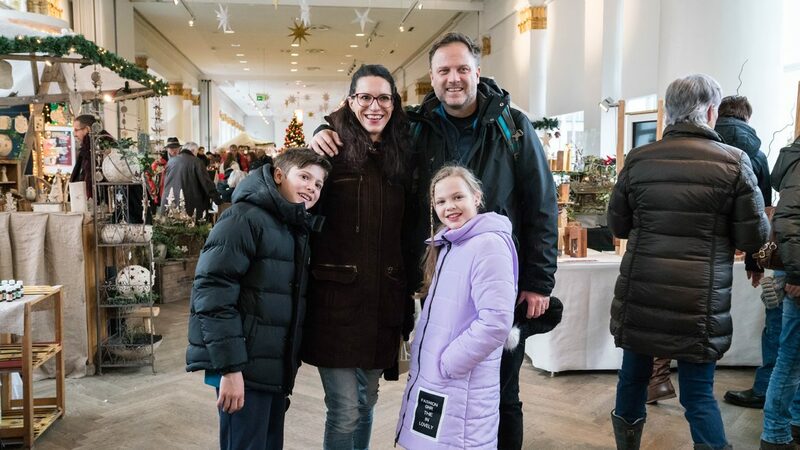 Fabio, Giulia and their children, Simone and Siria, experienced the Salzkammergut region before Christmas in its most splendid winter glory, tasted their way through the many Christmas markets and got into the Christmas spirit. These are their highlights and must-dos in the region. 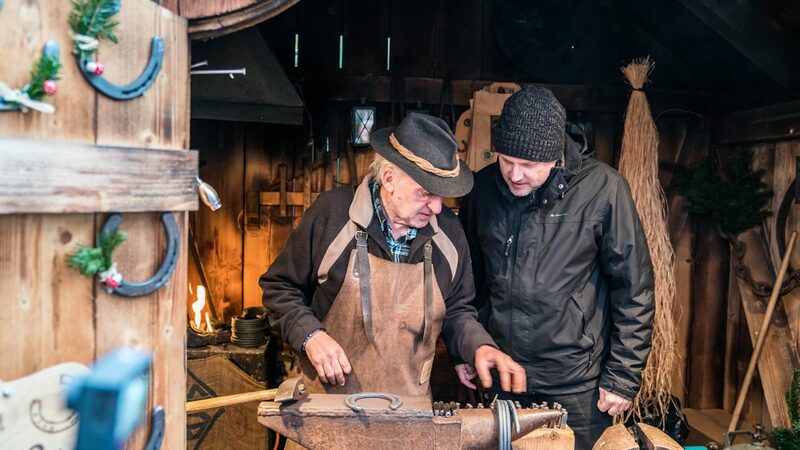 Fabio tried his hand at the St. Wolfgang Christmas Market as a blacksmith – and it turned out not so bad. There, the real professionals tap letters, numbers and motives as desired onto a horseshoe, which are then ideal as a Christmas present or a good-luck charm for the New Year! On Lake Wolfgang, many boats sail daily between seven piers – among them the one between St. Wolfgang and Strobl. This makes a “Christmas market-hopping” ideal and unforgettable. “Bambini con la Valigia” also opted for a boat trip to Strobl and chugged along on the calm waters from one Christmas market to the next. The Farmer’s doughnut is the epitome of tradition and Advent. It tastes best with sugar and jam. Whoever has never tried one, should add it to the top of their Advent To Do’s list. The best to try are ones made to granny’s recipe! 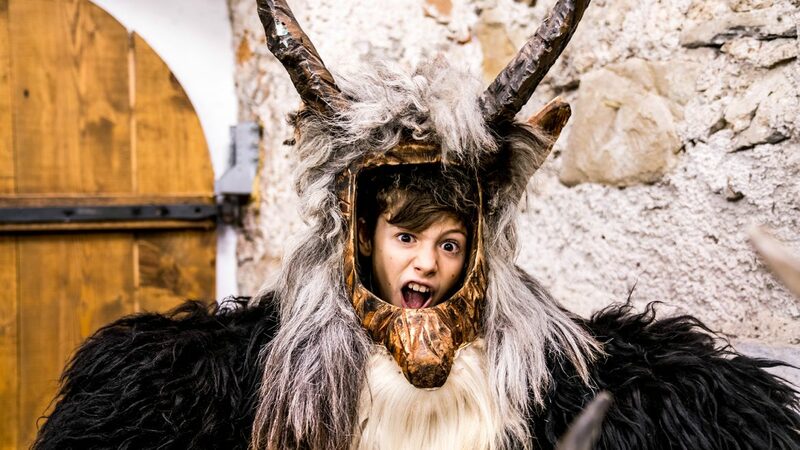 Perchten and Krampus’ belong to the pre-Christmas period just as much as the Christmas markets. The demonic faces, which can cause some fear, can be seen at the Perchten exhibition at Lake Mondsee in peace and at a safe distance. The very brave can try on the heavy masks and feel like a Percht for a short time. 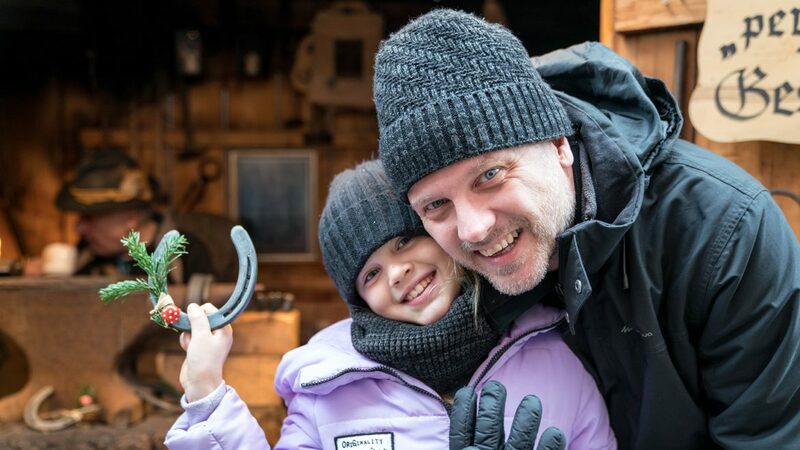 In the middle of Bad Ischl, in front of the Christmas lit Congress and Theatre House, “Bambini con la Valigia” strapped on their ice skates and took a few rounds on the ice. Anyone who needs a break, can get a refreshment at one of the stands all around or watch the others skating from the terrace of the Congress House. 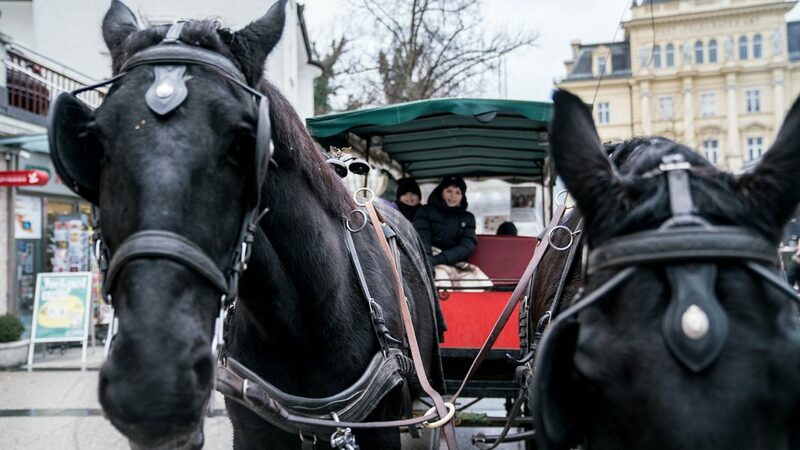 On a horse-drawn carriage ride through Bad Ischl, Giulia felt like Empress Sissi. Wrapped up in fluffy blankets, this Italian family saw the imperial city from a different perspective – and obviously enjoyed the beautiful ride. Simone and Siria were particularly pleased with the horses, which trotted gently through the streets. The Drink Hall in Bad Ischl is reminiscent at first glance of an ancient Greek building with its white columns and was formerly a lobby for spa guests, who took their drinks here. During Advent, the hall houses a Christmas market where especially fine craftsmanship is displayed. Anyone looking for unusual and high quality gifts will certainly find them here. At the Christmas markets in the Salzkammergut region, many craftsmen work “live” in their booths and allow you to watch them at work. Just watching them carving, sanding and hammering is worth it and you get the finished pieces almost first-hand. Where else can you get an up-close insight into traditional craftsmanship? Lake cruises are particularly lovely in SalzburgerLand, and no wonder, with so many lakes. 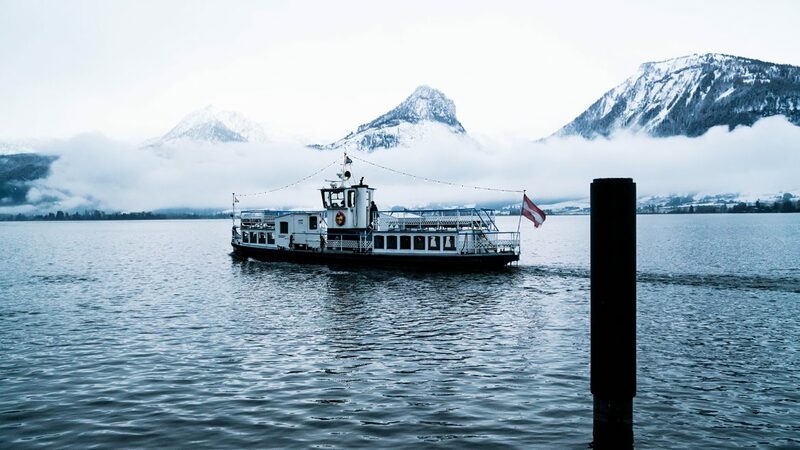 During a trip to Lake Mondsee, you should definitely plan to take a cruise, marvel at the surrounding peaks and enjoy the tranquillity of middle of the lake. 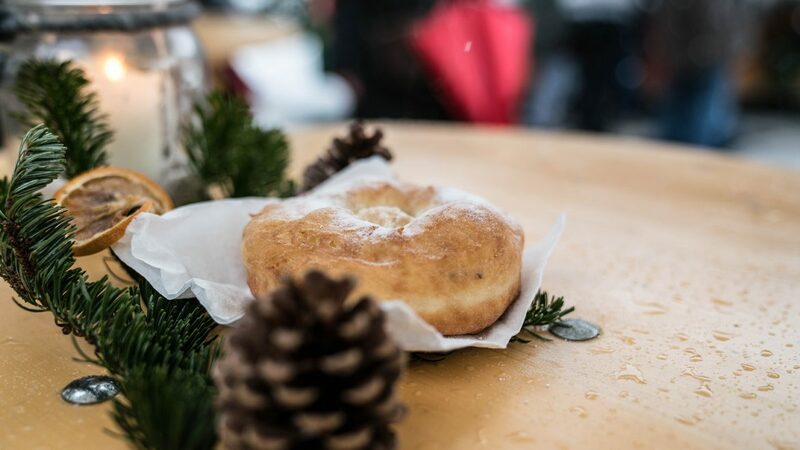 Once back on dry land, why not try a farmer’s doughnut or farmer’s bread at the Christmas market? When you’re on your feet and on the go all day, hunger rears its head at the latest in the evening. Fabio, Giulia and their children made themselves comfortable, after a long day at the Christmas market, in the Dorfalm in St. Wolfgang. This rustic mountain hut in the middle of the village not only offers tasty home-cooked food, but also has a private doll museum.